In combination with our PKI 9105 Hydraulic Jamb Spreader, the PKI 9110 as a series of door rams with different sizes and weights offers a perfect combination with our full range of tools to open doors by force. Every police-, military-, anti-drug and special operational task force team should be equipped with this product as it is the one and only device that is capable to give immediate entrance into rooms where scenes of crime are suspected. It really could not be easier to use and no setting up time is required. Originally the PKI 9110 have been developed for US Police Swat teams, but now are more and more used by police and Military Special Forces worldwide. Simply get in position in front of the door, swing the ram back to gain momentum and swing it forward to smash the toughest door. Three different versions are available – each one being electrically non-conductive, shock-absorbent, compact and this at a very reasonable price. 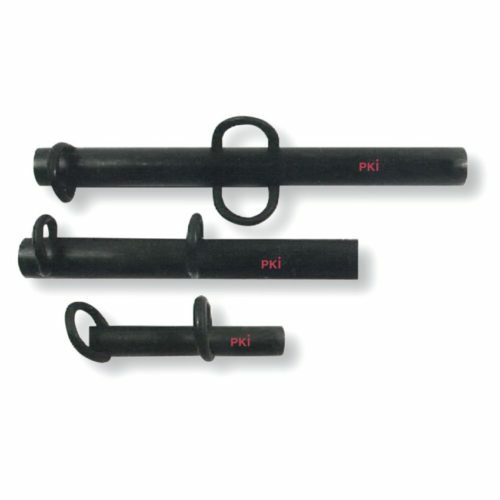 PKI 9110/B – This ram is a heavier version, 25 cm longer and 7 kg heavier than the above ram and can be used by either one or two persons simultaneously. PKI 9110/C – This ram is the smallest and most cost-effective door-ram yet designed. It is ideal for very confined spaces. It is made of specially modified steel shot and is only 41 cm in length, but has the same weight (16 kg) as the PKI 9110/A, and provides the same kinetic energy. We recommend the complete set of PKI 9110/A-C, however, each ram of course can be ordered separately as well.